Flood Bound is now available on YouTube. Watch the complete documentary film Flood Bound. As weather related disasters increase strong community bonds are the best plan for emergency preparedness. What happens when natural disaster strikes a tiny New England town? On August 28th 2011 tropical storm Irene hit tiny Pittsfield, Vermont hard, destroying homes and completely cutting off roads to the north and the south. Pittsfield was an island, with no power and no phone service. Then the amazing happened. Whatever you needed, someone had for you. A provisional medical clinic was set up in the library, food and water distribution in the Volunteer Firehouse, freezer emptying cook outs on the green, along with a makeshift school and soccer games for the kids. Bicycles and ATVs replaced cars, and hugs replaced nods as the standard greeting in town. 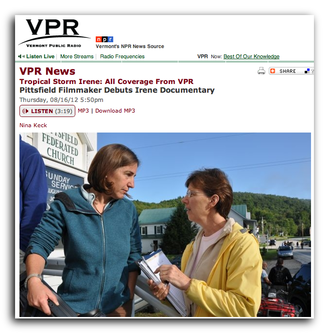 Filmmaker Marion Abrams, and 36 other Pittsfield residents, tell the story of a community that was always self-reliant, strong, ingenious and generous, proving itself (like so many other communities) to be even more so when faced with challenge.